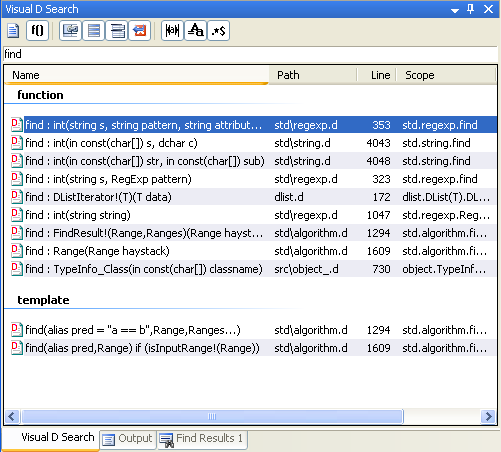 The search window helps you finding files in larger projects or symbol definitions. The window can be opened through the Visual D menu. 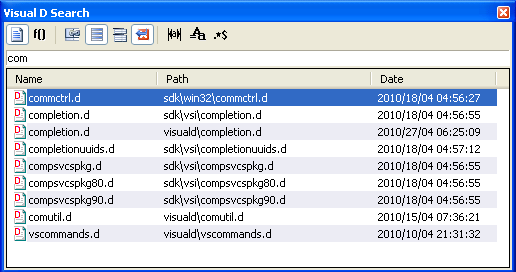 It is more convenient to assign keyboard shortcuts to the commands "VisualD. !SearchFile" and "VisualD.!SearchSymbol". In this mode all files in the Visual Studio solution are searched for the words given in the edit field. This mode searches the symbols found in generated JSON files for the words given in the edit field.